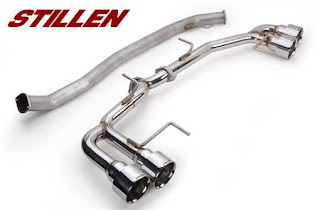 STILLEN is proud to offer the premier exhaust system for the 2009 Nissan GT-R. After many different styles and months of development Steve Millen and the engineers at STILLEN have come up with an exhaust system that offers increased performance, race-car sounds, unmatched quality and ‘work of art’ appearance. This exhaust system is constructed out of high luster polished 304 Stainless Steel. During the production process the rear exhaust components are polished five times to ensure a brilliant finish and to make sure that every part of the exhaust exudes excellence. To ensure superior quality the exhaust is TIG welded by hand and the weld ‘burns’ are left to maintain the race car heritage and look of the Nissan GT-R. The exhaust has been tested and tuned to offer superior performance and sound while offering a reasonable price. This exhaust comes with a lifetime warranty and is supported by years of racing experience from the experts at STILLEN.